Author LCPublished on June 6, 2011 Leave a comment on Lamentations 3:25-26 Please wait. I’m not very good at waiting. It is said that in Canada there are two seasons—winter and construction. We are currently in the construction season, and I would rather drive around the construction than wait for the flag person to allow me to go down the one open lane of torn up highway. It may take longer to go around, but at least I would feel like I was doing something. Recent events in my life, however, have been teaching me how to wait, a lesson that Jeremiah also learned. The first two and a half chapters of Lamentations recount the difficulties that Jeremiah faced—much worse than anything I’ve ever faced I might add. In my post of March 25, 2011 I talked about Jeremiah’s change of focus. In Lamentations 3:21-24, Jeremiah stopped focusing on his own trials and started to focus on God’s mercy and faithfulness. The second point is that Jeremiah has moved from depression to hope, and is now at the point of encouraging others to trust and wait patiently. God comforts and sustains us through our afflictions, so that we might be a comfort and encouragement to others. (II Corinthians 1:3-4) Our hardships generally come from our own mistakes or simply because we live in a world that is imperfect, where there is a constant battle between good and evil. (June 3, 2011) God doesn’t allow us to face trials beyond what we can bear, (I Corinthians 10:13) but when we do face trials, He brings good from them, (Romans 8:28) and through them gives us the ability to bring hope to others. Trust God, pray and wait patiently. The Lord is good. Published on June 6, 2011 Categories Prayer, TrustTags depression, God's goodness, hope, Lamentations, prayer, trials, trust, waitingLeave a comment on Lamentations 3:25-26 Please wait. Stress, stress, so much stress. Every day seems to bring a new problem that I don’t know the solution for. I know I am not alone. Lamentations 3:1-20 (and for that matter Lamentations 1-2) recounts the stresses, the devastation really, that Jeremiah faced. The people of Israel had been taken captive and Jerusalem had been destroyed. Jeremiah lamented his situation, dwelt on it and was completely depressed and hopeless. When I look at what Jeremiah was facing, and what others around me are facing it helps to put my problems into perspective. But as long as I focus on my problems, I, like Jeremiah, will be downcast. The people of Israel were being punished for their acts of rebellion. That is not the reason for our trials. Romans 8:1 tells us that there is now no condemnation for those who are in Christ Jesus. But the Lord still uses these trials to restore us to righteousness when necessary and also to teach us and shape us into the people that he wants us to be. Romans 5:3-5 tells us that we can rejoice in our sufferings, because they will produce endurance, character and hope. Hope is not merely wishful thinking; it is a confident expectation that God will keep His promises to us just as He kept His covenant with Israel. In Lamentations 3:21, Jeremiah changes his focus. He looks instead to God and realizes that it is because of God’s mercy that the tribe of Israel was not consumed altogether. And because of God’s mercy the same is true for us. The stressful situations may be endless, but the loving kindness and compassion of the Lord never end either. 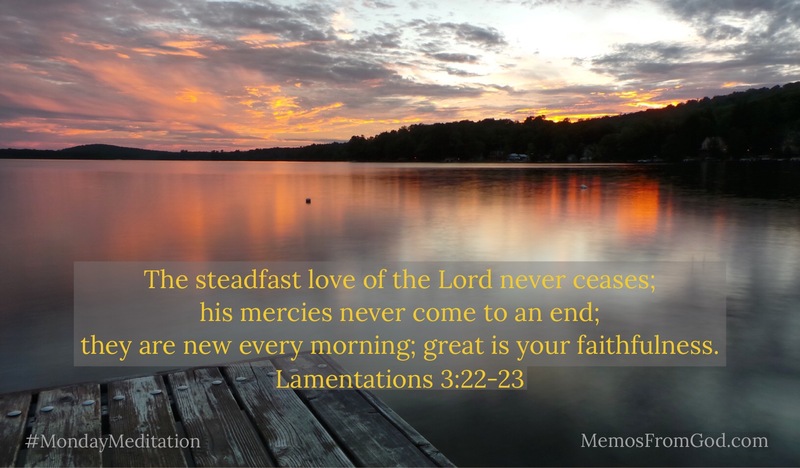 Every day He has new mercies for us. (Lamentations 3:22-24) Let us, as Jeremiah did, put our hope and trust in Him.